He married Dianah Winn13 [Dianna Winn4, Dianna Wynn5,8,9,14], Mar 15 185513, DeSoto County, Mississippi13. 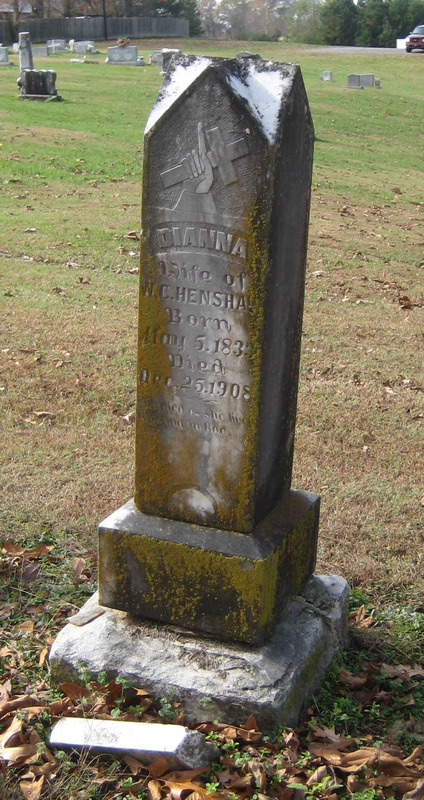 Dianah, daughter of Martin Winn & Jane "Jennie" Fulton1,2,3,4,5,8,9,10,14, was born May 5 18331,2,3,4,5,8,9,10,14 [Apr - 183715], McNairy County, Tennessee1,2,3,4,5,8,9,10,14. Wm Henshaw, age 30, born in Alabama; farmer; $1,240 real estate; $500 personal property. Diana Henshaw, age 27, born in Tennessee. Christiana Henshaw, age 3, born in Mississippi. M.E. Henshaw, age 1, born in Mississippi. Wm. Fulton, age 21, born in Tennessee; laborer. Henshaw, Wm, age 40, born in Tennessee; farmer; $1000 real estate; $500 personal property. Henshaw, Dinah, age 37, born in Tennessee; keeps house. Henshaw, Christiana, age 14, born in Mississippi. Henshaw, Mary E., age 12, born in Mississippi. Henshaw, Lucy, age 10, born in Mississippi. Henshaw, John, age 8, born in Mississippi. Henshaw, Victoria, age 6, born in Mississippi. Henshaw, Robt, age 4, born in Mississippi. Henshaw, Alice, age 2, born in Mississippi. Henshaw, W.C., age 50, born in Alabama; father born in Alabama; mother born in Tennessee; farmer. Henshaw, O.D., wife, age 47, born in Tennessee; parents born in Tennessee; keeping house. Henshaw, C.A., daughter, age 23, born in Mississippi; father born in Alabama; mother born in Tennessee. 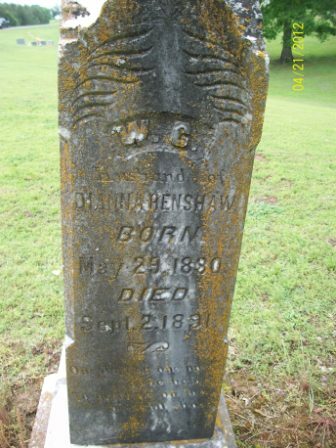 Henshaw, L.J., daughter, age 19, born in Mississippi; father born in Alabama; mother born in Tennessee. Henshaw, J.T., son, age 17, born in Mississippi; father born in Alabama; mother born in Tennessee; laborer. Henshaw, Victoria, daughter, age 14, born in Mississippi; father born in Alabama; mother born in Tennessee; scholar. Henshaw, R.S., son, age 13, born in Mississippi; father born in Alabama; mother born in Tennessee; scholar. Henshaw, O.D., daughter, age 11, born in Mississippi; father born in Alabama; mother born in Tennessee; scholar. Henshaw, L.F., son, age 8, born in Mississippi; father born in Alabama; mother born in Tennessee; scholar. Reid, C., boarder, age 23, born in Mississippi; parents born in Tennessee; laborer. RootsWeb WorldConnect data from Becky Thill () citing: Winn Family History, by Shirley Winn Harris 1985-1995. Letter from the Tate County, Mississippi genealogical society. burials, Bethel Cemetery, Tate County, Mississippi. 1850 census, DeSoto County, Mississippi; page 331B. 1850 census, Southern Division, DeSoto County, Mississippi; roll 371, page 331, dwelling #252. The Church Of Jesus Christ of the Latter Day Saints (LDS) International Genealogical Index (IGI) - Mississippi. Posting Dec 11 1999 by The Thill Group, Inc () to WINN-L.
1860 census, Senatobia P.O., DeSoto County, Mississippi; roll M653-581, page 55-56, line #40, dwelling #421, family #421. 1860 census, Senatobia P.O., DeSoto County, Mississippi; roll M653-581, page 55, line #30, dwelling #418, family #418. 1860 census, Senatobia P.O., DeSoto County, Mississippi; roll M653-581, page 55, line #33, dwelling #419, family #419. 1870 census, DeSoto County, Mississippi; page 329, line #40, dwelling #149, family #149. 1870 census, DeSoto County, Mississippi; page 329, line #36, dwelling #148, family #148.